Over the counter medication is generally believed to be safe by most of us. They come in colorful easily recognizable boxes that sit in our medicine cabinets. We reach for them whenever we have an ache or pain and don’t give it much consideration – at least not in the same way that we do with prescription pills. Listening to the vast array of drug commercials on television these days we have grown accustomed to hearing a huge list of side effects which range from mildly irritating to permanent and possibly life-changing on controlled medications. But what about the medications we take without thought on a fairly regular basis. Do they have side effects as well? The three most commonly used non-prescription pain relievers on the market today here in the US are Ibuprofen, Naproxen, and Acetaminophen. IBUPROFEN: Also known by a whole host of brand names including Advil, Motrin, Nuprin, and Ultraprin. The USES: It is used to relieve pain, tenderness, swelling, and stiffness, as well as menstrual pain, headaches, toothaches, arthritis, and backaches. Possible SIDE EFFECTS: The warning label states that people who take NSAIDs such as ibuprofen may have a higher risk of heart attack and stroke than those who don’t. Common side effects include: constipation, diarrhea, gas or bloating, dizziness, nervousness, ringing in the ears, unexplained weight gain, fever, blisters, rash, itching, hives, swelling, difficulty breathing or swallowing, hoarseness, tiredness, pain in the upper right hand portion of the stomach, loss of appetite, yellowing of the skin and or eyes, flu-like symptoms, pale skin, fast heartbeat, cloudy urine, back pain, blurred vision, red or painful eyes, stiff neck, headache, confusion and even aggression. NAPROXEN: Also labeled as Aleve, Midol Extended Relief, and Wal-Proxen. The USES: Nonprescription naproxen is used to reduce fever and to relieve mild pain from headaches, muscle aches, arthritis, menstrual periods, the common cold, toothaches, and backaches. It is also suggested for menstrual pain, bursitis, arthritis, juvenile arthritis, and tendonitis. Possible SIDE EFFECTS: All of the same listed side effects of Ibuprofen plus possible difficult or painful urination. ACETAMINOPHEN: Marketed as Tylenol, St. Joseph’s Aspirin Free, Panadol, and Halenol among many others. The USES: Acetaminophen is used to relieve mild to moderate pain from headaches, muscle aches, menstrual periods, colds and sore throats, toothaches, backaches, and reactions to vaccinations, and to reduce fever. Acetaminophen may also be used to relieve the pain of osteoarthritis. 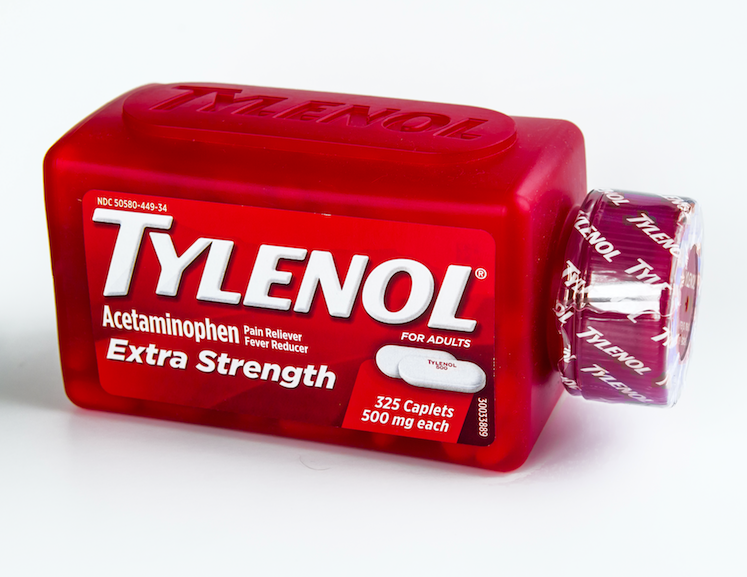 Acetaminophen is in a class of medications called analgesics (pain relievers) and antipyretics (fever reducers). It works by changing the way the body senses pain and by cooling the body. Possible SIDE EFFECTS: Side effects include rash, hives, itching, swelling of the face, throat, tongue, lips, eyes, hands, feet, ankles or lower legs, hoarseness, difficulty breathing or swallowing. Additionally, Acetaminophen, when taken beyond recommended doses or mixed with alcohol, can cause liver damage. Additional to the side effects listed, we also need to be mindful of mixing with other medications, which can cause interaction issues. One danger that isn’t often talked about is Drug-Induced Liver Disease. This encapsulates all liver diseases that are actually caused by physician-prescribed medications as well as over the counter medications and also recreational drugs. Some of the main culprits are pain relievers (primarily the three we have been discussing), antibiotics, antidepressants, anti-cancer agents, high blood pressure medications, high cholesterol drugs and those for diabetes and irregular heart rhythms. There is a wide range of severity in DILD. The scale goes like this. 1.abnormal blood levels of liver enzymes – no symptoms, 2. Hepatitis, 3. Necrosis, 4. Steatosis (accumulation of fat in the liver cells) 5. Cirrhosis, 6. Liver failure, 7. Blood clots in the veins within the liver likely resulting in death. If you have taken a good amount of these products, signs that you may have an issue and may need to be checked out are fatigue, weakness, vague abdominal pain, loss of appetite, yellowing of the skin, itching, bruising easily. More advanced cases you may see fluid accumulation in the legs and abdomen, mental confusion, coma, kidney failure and gastrointestinal bleeding. If these medications are so potentially damaging, what is there that we can do if we are in pain? Are there alternatives? Chiropractic: getting your body in working proper alignment is vital to overcome pain. SAM-E & MSM: for osteoarthritis – this is a painkiller and anti-spasmodic with analgesic properties. Extra Virgin Olive Oil: Acts much like Ibuprofen – anti-inflammatory and painkiller. Fish Oil: Omega 3’s help with rheumatoid arthritis, Chron’s disease, gout and even sinusitis. So next time, before reaching for the over the counter pain reliever, you may want to swing by the nearest health food store or stop into our office and get an adjustment and some heat, ice, ultrasound or electrostimulation therapy. Chiropractic care is a safe, alternative treatment when applied appropriately. Chiropractic treatments help in dealing with the symptoms of many conditions. Are you going to wait for your symptoms to be felt, or are you going to prevent it as soon as possible? Dr. Jason B. Kaster, a chiropractor in Fort Myers and Naples, can help you and your family achieve their optimal health. Have You Heard of Cross Patterning?